The Lauraceae are the laurel faimily, that includes the "True Laurel" an its closest relatives. The faimily comprises ower 3000 species o flouerin plants in ower 50 genera warld-wide. Thay occur mainly in wairm temperate an tropical regions, especially Sootheast Asie an Sooth Americae. 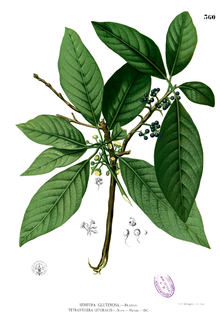 Maist are aromatic evergreen trees or shrubs, but ane or twa genera such as Sassafras are deciduous, an Cassytha is a genus o parasitic vines. ↑ 1.0 1.1 "The Plant List". This page wis last eeditit on 2 September 2013, at 14:57.